You can be the new ruler of Wirtland! Founded in 2008, Wirtland today is one of the largest and most stable virtual countries with a truly global representation. After over 10 years of successful growth, the founders of Wirtland have decided to sell the project. 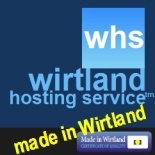 In case of interest in acquiring all the assets and rights, including Wirtland.com and Wirtland.net domain names and websites, please email your proposal at any of our official addresses, or via social channels. 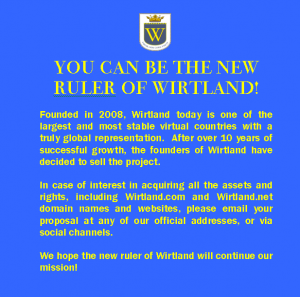 We hope the new ruler of #Wirtland will continue our mission! ¡Puedes ser el nuevo gobernante de Wirtland! Fundada en 2008, Wirtland es hoy el país virtual más grande y estable del mundo. Después de más de 10 años de crecimiento exitoso, los fundadores de Wirtland decidieron vender el proyecto. 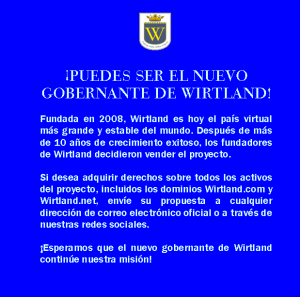 Si desea adquirir derechos sobre todos los activos del proyecto, incluidos los dominios Wirtland.com y Wirtland.net, envíe su propuesta a cualquier dirección de correo electrónico oficial o a través de nuestras redes sociales. ¡Esperamos que el nuevo gobernante de #Wirtland continúe nuestra misión! ВЫ МОЖЕТЕ СТАТЬ НОВЫМ ПРАВИТЕЛЕМ ВИРТЛАНДИИ! Основанная в 2008 году, Виртландия сегодня является крупнейшей и самой глобальной виртуальной страной. После более чем 10 лет успешного роста основатели Виртландии решили продать проект. Если вы хотите приобрести права на все активы проекта, включая домены Wirtland.com и Wirtland.net, пожалуйста, пришлите ваше предложение по любому из наших контактных адресов или через наши социальные сети. Мы надеемся, что новый правитель Виртландии продолжит нашу миссию! 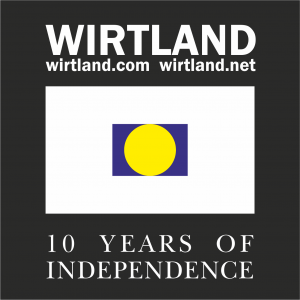 On the occasion of 10 years anniversary of Wirtland, Chancellor of Wirtland has made a short interview to The Times of Wirtland. Ten years have passed since you founded Wirtland. How can you assess the achievements? We had our ups and downs, but most importantly, the influx of new people has never stopped during this 10 years period. Wirtland has survived and kept its attractiveness as alternative nation – that’s our most important achievement. Also, we managed to preserve our neutrality, which was not easy in the times of fierce international turmoil. Some witizens complain about lack of activity in Wirtland. Can you comment? We see our main task to establish Wirtland as a platform, and to keep it up, running, and operational. That’s what we have been doing successfully during the last decade. If level of activity is low that means that people are passive. Activities are now up to the citizens themselves – we just create the right conditions for them. So, what should witizens expect from the government? Protection of citizens’ personal data. 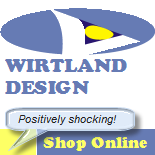 What should be done to further develop the Wirtland project? Happy Anniversary to all witizens and friends of Wirtland! 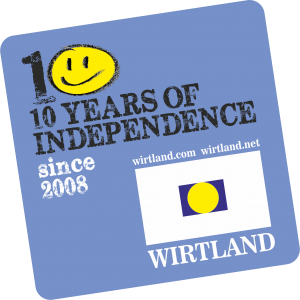 Today Wirtland is turning 10 years old. Ten years is substantial period for everyone; for a virtual state it is a record-braking lifespan. Wirtland has managed to carry its flag and to survive through a turbulent decade, marked both by tremendous geopolitical changes all over the world, and remarkable progress in IT technologies penetrating the daily lives of everyone. We are pleased to observe that the ideology of Wirtland has remained attractive, as we have been happy to welcome new citizens every week, coming from literally every corner of the world. Thanks to this constant influx of new people, Wirtland is now accumulating more innovative ideas than ever. Wirtland is a country which helps our citizens to make their ideas real. Wirtland wishes you prosperity, freedom, and independence! 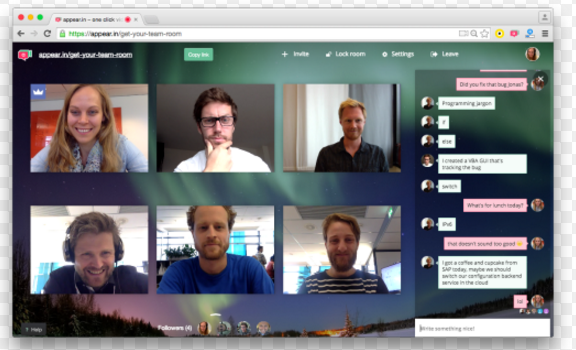 We have added an experimental new feature to Wirtland Network – possibility to communicate with online video in “Wirtland video room”. Please comment about your experience, usefulness, suggestions. Of course these members were blocked, and accounts deleted. 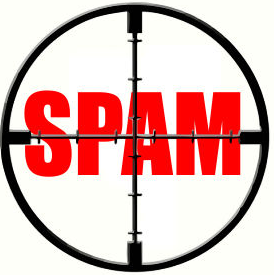 However we are asking everybody, in case of receipt of spam messages, please report immediately. 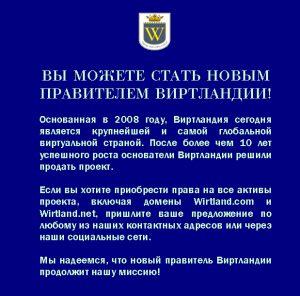 With your help we will keep Wirtland clean! Last February the Government of Wirtland started to appoint our official Representatives worldwide (see announcement). We are pleased to communicate that we now have Representatives in 6 countries: Bulgaria, Columbia, Israel, Italy, Peru, USA. For more information, click on Reps tab. Our latest Representative is Ever Dávila in Lima, Peru. His communication languages are Spanish, English, Portuguese. Wirtland extends warm congratulations to Ever! The Representatives offer assistance to new members and answer questions. The status of official Representative of Wirtland is regulated by special Law. 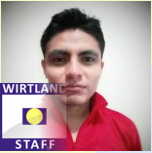 The Representatives have an access to special group Wirtland Staff. ▰▰▰ Wirtland needs many more Representatives! If you want to become a Representative, please read here.